At a time when rebellion is the primary form of conformism, and most of us have been shocked so many times that we barely jerk when we are touched by the enlightening intentions of some new cattle prod, Ann Craven's paintings of birds and deer are genuinely disarming. Having indulged ourselves and suffered through every spectacle, most of us, on the Chelsea amble, are prepared for just about any eventuality. Except this. Cute, big-eyed, brightly painted animals. One may attempt to fit these 17 paintings into the generally approved kitsch category. Other birds have touched down lately -- such as, in stark contrast to Craven's birds, John Newsom's sado-birds. (More related to Craven's subtle anthropomorphism is Michael Joo's current show at Anton Kern, which includes many four-legged coyotes and a single five-legged one.) Cultural sentimentality is always an appealing target, whether it is bulls-eyed in the form of iconographic personas or objects, or pop-culture signifiers. Yet Craven's animals, for all the outward corollaries -- the brightness, the adorableness -- extend no invitation to an interpretation of sentimentality, and, therefore, no juxtaposition of irony. At the opening of Craven's first show at Gasser & Grunert, one overheard a good deal of painterly debate on Craven's brush strokes. There's a bold variance at work -- from broad, blurring backgrounds to the fine feathers of Craven's canaries. In the bird paintings, Craven's avian figures "pop" from a somewhat diffused background. The technique, besides being dimensional, helps Craven to straddle the dividing line between ornithological study and a Tweety Bird cartoon. The soft focus of the background, as well as being common in National Geographic-type photography, implies the cell process of animation, in which the foreground figure, perpetually mobile, is suspended on a static scenic stage. By either reference, we are reminded that this creature was doing something before it was interrupted, and whether or not that something was enjoyable or tiresome to that creature, they'll likely go back to it when we go away. There is a suspended reality to Craven's paintings, which is compounded by an inability to understand Craven's subjects -- to look across the expanse that is between them and us. An association is immediately made to childhood -- and the ethereal nature of recall. Like memories, Craven's simple images suggest larger cognitive and emotional roles. 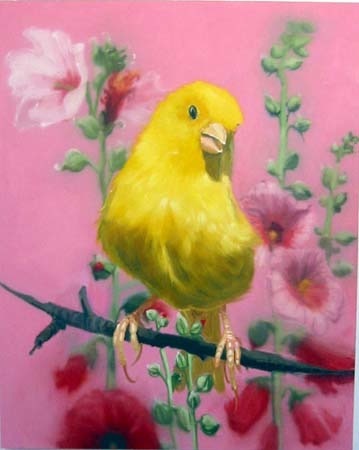 Colors, which might at first seem archetypal in their purity, are transformed, such as the case of the backdrops of Craven's yellow canaries, into a purple pink, a red pink, a green pink, a yellow pink and an orange pink. These slight variations create wholly independent environments, and suggest not only the similitudes of experience, but psychologies, by dint of minor differences, of unfathomable separateness. The one thing all the paintings have in common is the fixed stare of the subject -- be it pied mynah, white-tailed deer or African gray parrot. Across the inter-species divide, they look out, in terror and elation -- the thrill and threat of having made contact. Either you go or I go, say their postures. Always, we are on the brink of departure. In the black eyes of Craven's animals, we are faced with the seeming viability of an empathic exchange, as well as the impossibility of that communion. Such fleeting instances are significant not only of memory, but of dreams and self-reflectivity. There is that moment when we all wonder how "here" we are, and if even that wondering isn't somehow illusory. We are real and absurd -- evolutionary wonders, and cartoons. Infinitely active, and infinitely divorced from the blurred settings behind us. The canary peering out from Craven's announcement gives the impression of being one of those strangers on the subway -- those ones we wonder about, those ones that trigger our wondering about ourselves. And no, according to Craven, we are not the exotic animals that we fancied we were. We are just parrots, canaries, deer and starlings. World-over and common animals -- animals exported, owned and thoroughly understood. Even the deer, to some degree, carry with them the idea that they are preserved only for hunting. Indeed, one cannot help but wonder if all of Craven's animals are being viewed through the sight of a gun. The claws of her canaries are woefully inadequate to fend off the threat that we, the looker, engender. The animals that Craven chooses as our totems are those animals that, within the humanity context, are allowed to live.